I got this question today, and it’s a question we address constantly. I thought I’d write about restarting facial topical Tretinoin after a Blue Peel Radiance (Obagi) Peel treatment on the face. When should I re-start Tretinoin again after I receive a Blue Peel Radiance Peel (Obagi)? The quick answer is about 6 days to restart your tretinoin, also known as Retin-A (among other names). The range for most patients would be 4-8 days. Some can restart sooner if there wasn’t too much irritation from the Obagi Blue Peel Radiance. The problem of starting Tretioin too soon after a Blue Peel Radiance is that your skin may become too irritated and uncomfortable. The same goes for restarting all the other Obagi Nu-Derm skin care products which may have been stopped – such as Exfoderm, Exfoderm Forte. Everyone’s skin is a little different and every esthetician, doctor, dermatologist, surgeon, nurse has a different plan. My guideline of about 6 days works for us at Surgical Artistry, Modesto. But please consult your own practitioner for their own preferences. Our plastic surgery office is directed by Dr. Tammy Wu, Plastic Surgeon and we are located in Modesto, California. Different locations and different climates on the skin affect these recommendations on returning back to tretinoin use. Download the Blue Peel RADIANCE After-care Card here or with the below link. The pdf file above will talk about the importance of applying Sunscreen. When to consider another Blue Peel Radiance Chemical Peel. One can consider another Blue Peel Radiance chemical peel about 1 month later. 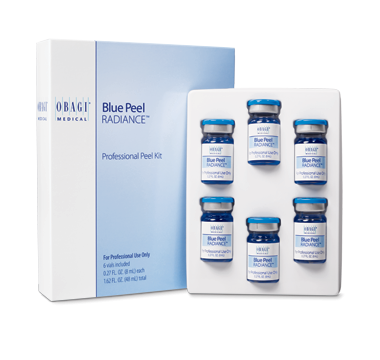 Theoretically, one can consider a repeat Blue Peel Radiance as close as 2 weeks apart. The purpose of “stacking” the peels closer together is to continue to get better results. After about a series of 5 peels, the improvement is at it’s maximum, and then the goal is maintenance which may be achieved with continued peels every 2-3 months. This entry was posted in Chemical Peels, Cosmetic Surgery, dermatology, Education, Head and Neck, Modesto, Obagi Blue Peel Radiance, Plastic Surgery, Skin Care and tagged aftercare, obagi blue peel radiance, postprocedure, tretinoin on April 17, 2014 by Calvin Lee, MD.